Accepta 0503 is a high performance, low toxicity, environmental friendly, multi-metal corrosion inhibitor developed for use in closed circuit hot water and chilled water systems. Accepta 0503 is a neutral inhibitor suitable for multi-metal systems including aluminium and aluminium alloys. If a neutral environment is required, Accepta 0503 should be considered as the preferred inhibitor. 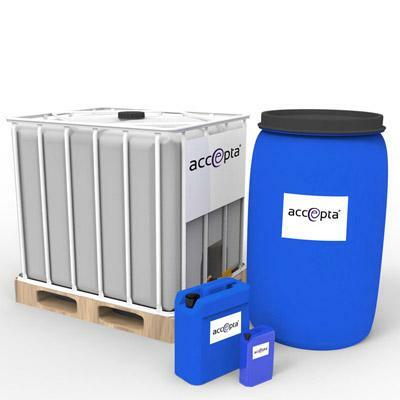 Accepta 0503is compatible with ethylene and propylene glycol solutions. Compatible with ethylene and propylene glycol. For mild steel/copper systems Accepta 0503 should be dosed at 1% of the system volume, equivalent to 10 litres per m3 to give approximately 100 -120 of molybdate as MoO4. For multi metal systems containing aluminium Accepta 0503 should be dosed at a minimum of 1.5 – 2% of the system volume, equivalent to 15 – 20 litres per m3, to give approximately 150 to 200 ppm of molybdate as MoO4. New systems should be pre-commission cleaned prior to dosing. Accepta 0503 is normally added via a dosing pot or a positive displacement pump..